In the golf community, there is a wide variety of products that golfers need. Now, have you ever thought of products that can make your life easier but are dedicated to your golf bags? For instance, have you ever thought of purchasing specific cleaners? How about an organizer? With this, there is a wide variety of different organizers in the golf world and our intention was to find the best one. The organizer that you choose really depends on how much you want to organize. For instance, there are some that are dedicated to two bags and there are some that are dedicated to one bag. They also have many nifty features and quality benefits to them. Therefore, it is important to note exactly what item you want. With that in mind, they also offer a wide variety of features to choose from, so this is another important factor to consider. Without any more wait, let’s talk about the first one on our list and keep reading for our specialized criteria below. As the first golf organizer on our list, here's an expert product that is designed to be durable and easy to use. This comes from a trusted brand in the golf world, Suncast. With that, here's the GO3216 Golf Organizer and two specific features of this quality product! 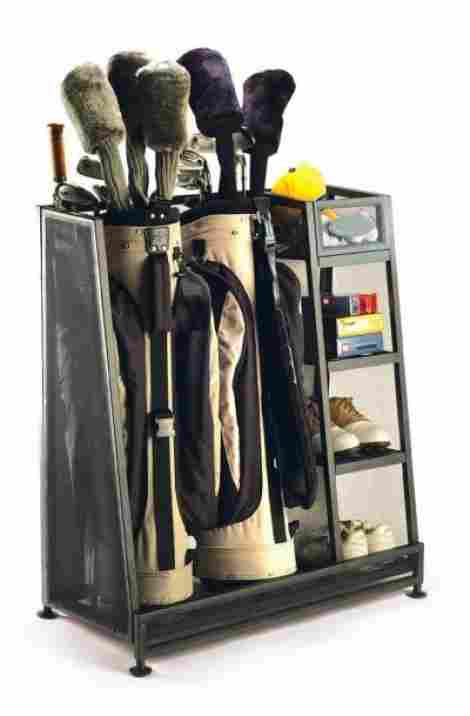 This item is designed to be a stand-up product that stores and acts as an organizer to all of your golf equipment and gear. Place it in a bedroom or a closet, or even the garage and golfers can expect that all of their gear will be well organized. With that said, this product allows for the organization of two golf bags. However, the golf bags have to be a bit skinny and nothing too large or they will not fit. This product comes with adjustable feet for leveling. So, the benefits are of this are as follows; first, the adjustable feet allow individuals to easily level the item. Secondly, the adjustable feet allow for the item to be a bit higher than the floor, in the event that water spills or the garage or rooms get slightly flooded, individuals can know that their gear will be kept safe due to the leveled design. To discuss the pricing, this is a quality design and easy to use product. With that, it happens to currently be on sale and individuals can purchase it at a discounted price. Overall, it has plenty of space for individuals to safely and easily store their items. The sturdy metal construction also allows the quality design of the product. 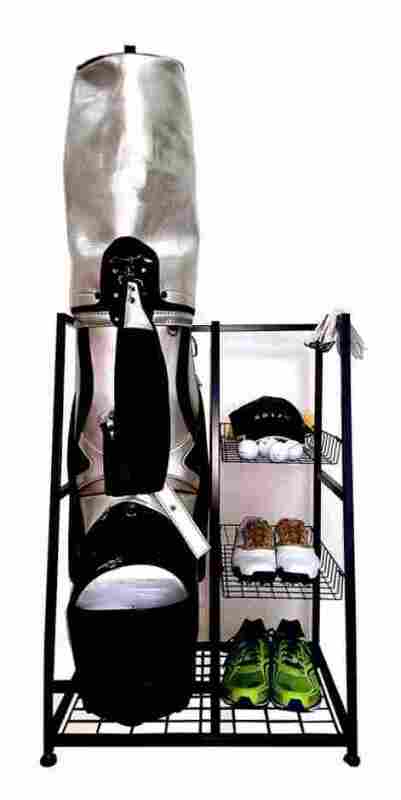 For home storage of all golf gear. Easy to store shoes and more. Cannot hold two large golf sets. 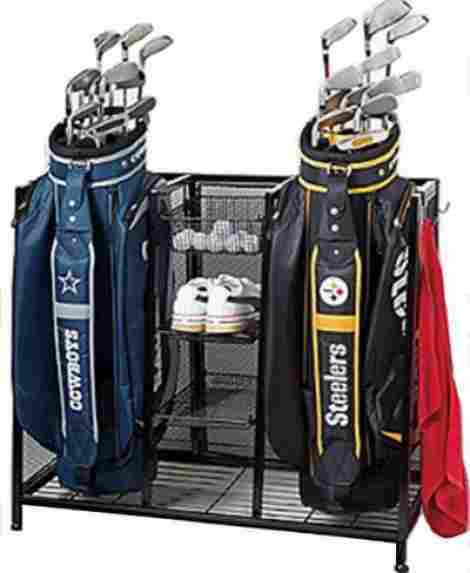 This next item on our list is the Home-It Golf Bag Sports Dual Golf Storage Organizer and it is a quality golf rack that is designed to easily store two golf storage bags on each end and plenty of gear in the middle. With that, this product is designed to last and it is built from a steel construction that allows for easy carry and storage. This product is designed with four shelves in the middle that allows individuals to easily be able to set up their accessories. In this, the shelves are durable and made of the same steel construction as the frame and base of the product, so it allows for quality use and individuals to easily be able to take advantage of the storage options. This product has a quick and easy assembly design that allows for individuals to easily be able to set up in minutes. With that, you can easily assemble it in a garage or a room for easy use. Alongside this, the bottom is designed to be higher than the ground in the event that an individual encounters water on the floor, the gear does not wear or damage. As far as the price and benefits go, this product is high-quality and an easy to assemble. In this, the design is very lightweight, unlike other different organizers. With that, this product is easy to use and comes with easy to understand instructions. Overall, individuals will find it to be useful and easy to move. May be too lightweight and not hold things fully. If you are worried that your golf organizer may not be able to handle the large golf bags that you have, this is the one for you. This may be the best-designed quality organizers that are designed to be easy to use, easy to assemble and very durable. With that said, these handy storage rack organizers allow for individuals to easily be able to organize their larger items. This is the Milllard Golf Organizer Extra Large Size. This product is designed with high-quality features in mind. This particular product has a soft foam edge that allows individuals to easily be able to prevent any wear and tear to their clubs or golf club set. In this, the extra lip at the bottom of the stand allows for better safety and prevents the stand bag from falling out. This product is made with the best materials in the golf world. This item has a quality construction that is made of carbon steel. If you do not know about this material, it happens to be high-quality and quite durable. To add to this, the material is carefully constructed to be anti-rust and top quality. To discuss the price and value, this product is high-quality and a reputable stand. To add to this, it happens to be rust resistant, wear and tear resistant, and also designed for easy access to all important items. The price is a bit higher than other brands, but it is well worth it if you want three shelves, one closed shelf, and a quality stand section. Quality leveling to prevent any wear and tear. Two standard large size golf bags. A bit smaller than expected. This next product on our list is a golf organizer that allows for easy use and a quality moving design. The heavy-duty design allows for individuals to easily be able to place two bags and all the gear they may need for the golf course on it. Let's explore the SafeRacks Golf Equipment Organizer and two features to consider this excellent product. This product has a sturdy shelf design. The sturdy shelves allow individuals to easily be able to store their tees, hats, shoes, and other cold weather gear and accessories. To add to this, individuals can easily store important items and products to make it easy to keep track. In this, the overall design has plenty of shelves and even comes with a removable top that adds extra storage. This item includes wheels on the bottom, which is a g reat design feature of this product. The wheels allow for individuals to easily be able to use this item and slide it from room to room. Now, our favorite part is the wheels have locks so golfers can easily lock it in place, once it has been placed in the right spot. Durable rack that can hold more than 55 pounds. Allows for all sized golf bags. Can easily be moved from place to place. Quality reviews and 4.5 stars. This product is simple and designed for two bags. With that said, it has four shelves for easy storage and it also is very easy to assemble. Let's highlight the durable and rust-resistant HC Golf Organizer. Let's explore two features to consider this expert quality product. This product is designed with a powder-coated steel design. The powder-coated steel allows individuals to trust that the product will not rust and will be able to be resistant towards water and moisture. The steel construction is also very durable, high quality, and made to last. Although it is a bit heavier because it is made of steel, it is very high quality. If you want to store two medium side bags, this is the item to get. The bottom bar also allows for individuals to easily be able to store the bag and have it stand up without fear of it falling or toppling over. To add to this, it keeps your garage area organize and it can easily be placed in a room or garage. To discuss the cost and the value for this item, we first have to say that individuals will find this product to be quality and effective in use. To add to this, the design is a very simple and it allows for easy assembly. With that, golfers will find this item easy to use and very great as a simple storage product. Now, it can only be bought by specific sellers and the price will vary. Powder coated design for anti-rust. Makes it easy to find your gear. This next storage rack on our list is a simple design that makes it easy and simple for individuals to be able to wall-mount their items. With that, it is very durable, easy to adjust and overall, very high quality. With that said, let's explore two features of the Racor Pro PG-2R and what golfers can expect when it comes to design benefits. This item is very different compared to others on the list because it is a wall mounted rack that allows for the easy storage of golf bags, shoes, and more. In this, the design of this wall mounted product is easy to use, high quality, and very simple. 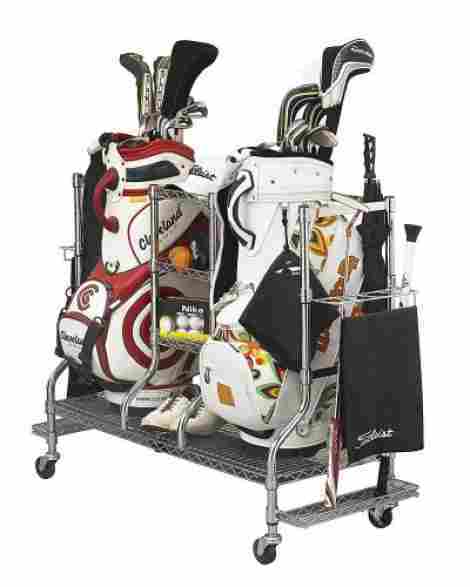 In fact, even stores two pairs of golf bags with clubs in one simple place. To add to this, it also allows for the storage of golf shoes and other items. The finish of this item is an epoxy finish that is designed to be corrosion resistant. With that, it has a steel construction for optimal durability. Therefore, golfers can expect that their gear, items and golf equipment will be well taken care of during installation. To add to the price and value of this item, the hardware of this product is a quality hardware that guarantees years of use. This item also is priced very affordably because it is not a full rack that is stand alone, it is a wall mounted simple rack. With that in mind, it actually comes with five-star reviews and plenty of positive feedback from consumers. Stores two bags with clubs. Stores two pairs of shoes easily. Steel construction for optimal use. A lot smaller than most brands. 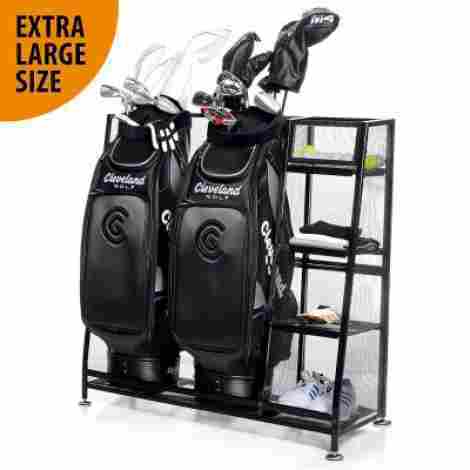 As the next organizer on our list, here's the JJ International Single Golf Bag Organizer, a quality product for individuals that want an easy one-bag organizer. This product is not only designed to last, but it is also very durable, high quality, and easy to use. To add to this, the design of this item is made from great materials while also being really simple to assemble. This product is powder coated for a long lasting design that is very strong and is resistant towards wear and tear. In this, the quality shelves, the design, and the leveled design allow individuals to have a quality machine that they can easily use. In this, the overall product is easy to organize and easy to move from one place to another. The construction of this product is the pinnacle of a quality design. It is made from a durable and long lasting steel construction that allows for individuals to trust the durability of the product. It is coated all in black and it is very high quality when it comes to the design and construction. When it comes to the value and price for this item, it is very effective. With that, golfers will find this easy to use and very simple to assemble. Now, for the price, it is reflective of the fact that an individual can only store on the golf bag. But, if you are a single player family, then it may be perfect for you. Can only store one bag. This is a quality product that is, most importantly, fully functional and easy to use. The design allows for the storage of two bags on each side and easily store all products and golf gear in the middle. With that, it is very effective and easy to place in any area of your home or garage. 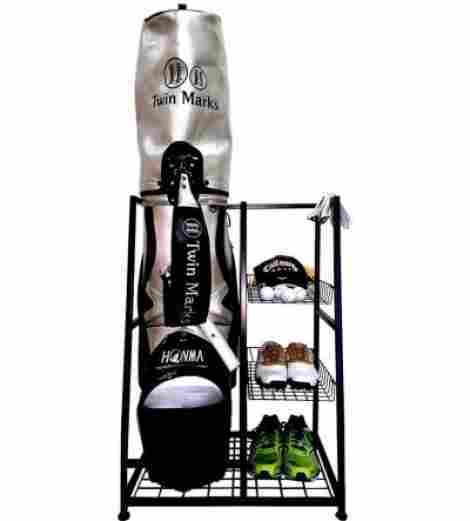 Let's explore two features of the Anahs Market Two Bag Golf Organizer. This product could be named the most unique design on our list. This product has three wide baskets in the middle of the construction that allows individuals to easily be able to store their golf tees, golf balls, and shoes. With that, this item also has a wire steel frame bottom that allows for any moisture, or water because of rainy days to pass through. The design of this item includes four metal hooks that make it easy for individuals to easily be able to hang their coats and other items. In this, the overall design is very simple and allows individuals to easily keep all of their golf gear and products in one place, making it very easy to find. This product is well worth it if you want to store all of your gear in one place. The price reflects this benefit and the fact that this product is also rust resistant and wear and tear resistant. The compartments, the design, the hooks, and the overall construction make it easy for individuals to keep track of their gear. Quality design and built to last. Four metal hooks to hang additional items. Three wire baskets for storage. Coated to be rust resistant. Bulky and takes up space. This item may be the biggest and most useful on this list for individuals that want a product that allows for easy storage benefits. This product is from Tangkula and two reasons why this product is so special. This item is easily well-constructed. It is firm and made of carbon steel. The best part of this material is that carbon steel is designed to be anti-rust and highly durable. In addition to this, it is water resistant and resistant towards humidity. This product is designed to offer an easy care design towards all gear and golf clubs. For instance, this product comes with a soft foam edge that allows individuals to easily keep their important clubs on the rack without worry that they will get nicked. In this, the extra lip at the bottom allows individuals to keep them from falling out. Golfers can expect this product to be a blend of quality and easy to use. To add to this, golfers can expect it to be durable. It has three shelves for easy storage, a quality design, water-resistant features, and overall, it is priced below other brands that offer the same features. This next product on our list is a simple organizer that offers impressive quality and is easy to use. To add to the beneficial design, it is a simple one bag design with shelves for easy storage. Let's explore two benefits of the Twin Marks Single and what golfers can expect when it comes to design benefits. 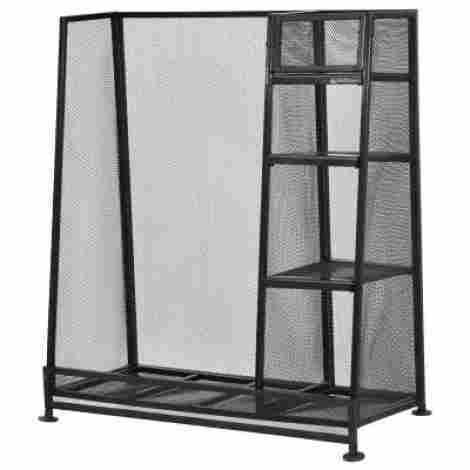 This item has two basket shelves that make it easy for individuals to store and keep track of their gear. With that in mind, it is very easy to keep all of your important items in one place with the two basket shelves. With that in mind, the compartments are a high quality, easy to use, and the overall construction is quite valuable. This item is designed to be powder coated and very high quality. In this, the steel construction allows for the products to never warp or get damaged. The coated design works with the steel to create a rust-resistant design. Overall, this item is durable and the best benefit is the single design. When it comes to the price and value of this product, it is very valuable and very high quality. To add to this, the design is simple and golfers can expect the rack to hold it’s weight well. You can either store your shoes, gear, or other products, and it will be able to keep it organized well. In this, the price is reflective of some brands that sell these products for two bags. With that, if you like the design, this is well worth it. Fits one normal sized bag. Easy to keep track of products. Same price as brands that sell for storage for two bags. There is a wide variety of different products in the golf world and it all depends on which features matter the most to you. With this, it is important to consider the measurements of your golf bag, the quality, and the overall design. Also, other factors to look into are the space of the area you will be placing the rack and also the room it will be going into as there may be humidity or potential water damage. With that in mind, let’s move forward and discuss with our audience the criteria used in the evaluation. This criterion is designed to help our audience find the best top of the line products and our goal is to share some important tips on which one to choose. So, let’s move on! As the first criteria of a quality organizer, it’s important to have the right material and frame design. The reason being is that you want to make sure that the material can hold plenty of weight, and can organize your items well, alongside other important features we will discuss. First, the most common material is carbon steel or steel. The reason being is that these two materials are highly durable, high quality, and designed to not warp or begin to wear and tear easily. Most importantly, the frame is designed to be very easy to assemble, while also being sturdy enough that an individual can trust that the equipment and design of the products will be able to hold up. Now, an important feature to consider when selecting a quality organizer; the coating. Many organizers are designed with powder coatings that cause the product to be anti-rust and water-resistant. Since steel can easily rust, many of the products we shared are powder coated and designed in the event that water comes into contact with the steel, it does not penetrate through. So, here are the bullet points to take away from this. Carbon steel and steel are the two main materials. Most organizers are powder coated for water-resistance and anti-rust. The design and quality is another important and crucial factor to consider. The reason being is that you want to make sure that the design is effective and organizing the most important golf items that you want to organize. With that, we determined that there are various similar designs in the golf world. 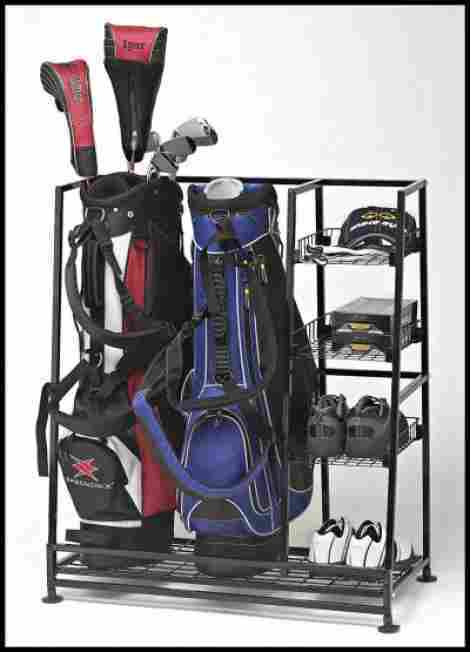 The most common designs are one or two golf bag designs with shelves in the middle of the side. With that, many of the shelves tend to be designed for the organization of shoes, other important items, gear and more. Overall, the design and quality is really determined the durability of the framework and the brand. Therefore, it is important to consider what design is the best for you. The most popular are one or two-bag designs. Many of the organizers have shelves. Some organizers even have bin designs to keep your golf balls. Most of them are also leveled for water safety. Most of them have a foam lining to prevent nicks from occurring on the club or bag. With all of this in mind, let’s move forward onto the last criteria to consider when selecting a quality organizer, these are more of extras and other tips to consider. When considering the best golf organizers, check out the following tips and extras to consider when selecting a quality product. The cost is an important factor to consider because of the more organization and quality benefits the more the product will cost. With that said, the cost is determined by the size, quality, and benefits, so consider this as an important aspect of your selection process. There are two types of designs we encountered, powder coated black and steel color. In this, the powder coated black tends to be the most durable and high quality. 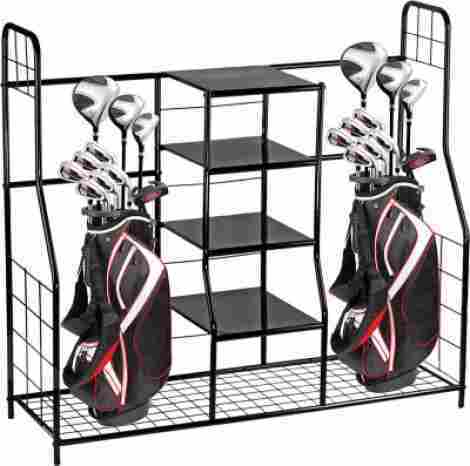 The purpose of a quality golf organizer is to help you organize your space. Therefore, we want mention that space saving is an important factor to consider when selecting the best product for you. You want to make sure that it will be space saving and not bulky. For the next criterion, quality and reviews are the last most important element because it helps guide us, and you, to discover which is the best product. In that case, our intention is to always focus on products that have above four stars or products that have plenty of positive reviews. Q: How do I clean the metal of the organizer? A: This is an excellent question. Considering the fact that metal ends up rusting, it is important to buy a metal cleaner. However, some of the organizers are designed with a powder coated design that allows for anti-rust benefits. With that, you can wipe that one down with a wet rag easily. Q: How many shelves do they bring? A: The most common number for shelves for an organizer is between three and four. Some of them even have bins. It all depends on which organizer you want for your garage or home. Q: Does it come with everything needed? A: Yes, all of the organizers come with everything a golfer will need to easily set it up. This includes instructions and tools. Most of them are easily set-up assembly and are designed to be set up in less than ten minutes. Q: Is there a warranty on the product? A: Most brands do have a return policy. However, we did not see many brands that offer a warranty. Therefore, it is important to consider which brand has the best warranty in the event it gets damaged or you want to return it. Q: Can I powder coat the steel? A: You can actually powder coat the steel yourself if it does not already come powder coated.